Tattoos have been a part of human culture for more than 4,000 years, according to Dr. Gary H. Manchester, and the dilemma of removing unwanted tattoos has existed just as long. A technique known as salabrasion has been used for centuries to remove tattoos, and although more technologically advanced methods such as laser tattoo removal exist today, salabrasion is still used to remove unwanted tattoos. While salabrasion is effective for removing tattoos, you need to know about the technique before deciding to erase your tattoo using this method. 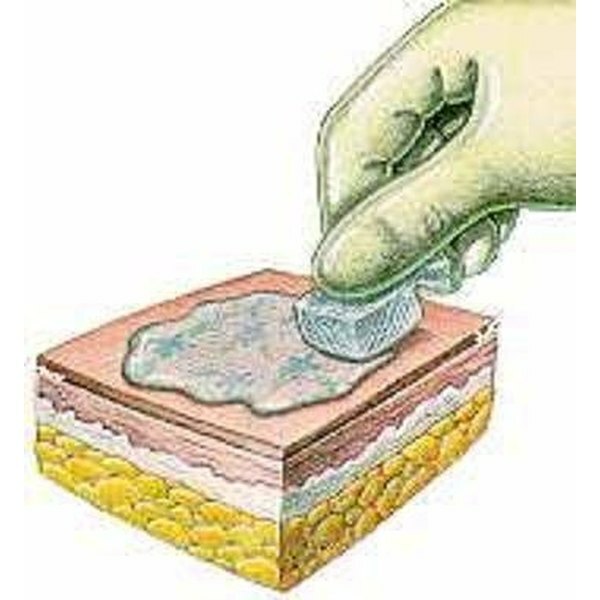 Salabrasion tattoo removal uses simple ingredients--plain table salt, tap water and an abrasive device such as a wooden block wrapped in gauze. A local anesthetic is sometimes administered before the procedure, says Patient-info.com, since there may be some pain involved. The salabrasion process takes little more than 30-40 minutes, according to Manchester's report. First, the person performing the procedure will shave the tattooed area if any hair is present. Then he applies salt mixed with water to the tattooed area, and uses the abrasive gauze surface to vigorously rub the region until it turns a deep, blood red. He'll then apply an antibiotic ointment and a sterile gauze dressing, which is left in place for three days. After this time, the dressing is removed from the abraded area, and the skin--which will be raw--is covered once again with salt for several hours. Another treatment with antibiotic ointment follows, and it'll be redressed and let heal for three more days. Remove the gauze after the second three days. At this point, the skin may appear leathery and have a rough texture. The salabrasion-affected region of dead skin will begin to separate from healthy skin beneath within one to five more days, pulling tattoo pigment away with it. As the skin heals, remaining pigment naturally leaves the tattoo. When the skin is fully healed, the tattoo may be completely removed. If remnants of the tattoo still remain, additional salabrasion treatments may be necessary to remove any remaining pigment. Dr. Eric Bernstein, in a report on TattooRemoval.net, states that more than one salabrasion treatment is almost always necessary. While Manchester states that little or no scarring will occur after salabrasion, Bernstein says that salabrasion almost always results in a visible scar. Salabrasion, while effective for removing tattoos, carries risks. Scarring is at the top of the list--it's possible that you may replace an unwanted tattoo with an unwanted and unsightly scar. Techniques like salabrasion always carry a risk of infection as well, so make sure that if you're planning on using salabrasion to erase a tattoo, you go to a reputable tattoo removal specialist with sterile equipment. If you're in doubt at all about how you should get a tattoo removed, consulting with your physician is always a good idea. Remember, you have other options besides salabrasion--click the link in the resources section below for more information.